There was little intellectual discrimination however in her impressionistic account of the Frontline Event. She suggested that I had only a ‘slender grasp of anything much’ and that I closed my eyes when a particular lady was speaking, which is poetic license since I did nothing of the sort. Roma it seems was evidently deeply moved by the lady, so much so that her narrative got confused and she started by claiming that the lady finally began to shout, before describing how the lady got up to speak. Not surprisingly, while Roma was impressed by the lady having claimed ‘earlier that she would not cry tonight as she had spent the whole day crying’, I had in fact heard the lady making the same statement with the same emotional input at a previous event at the Royal Commonwealth Society. The only difference was that this time round she claimed that her father was a Tamil politician who had been killed by the Tigers. That was unusual, but it clearly sprang from the fact that those who had gathered there to assert categorically that the Sri Lankan State was genocidal were thrown by the statement of Arun Tambimuttu, whose parents had been killed by the Tigers. No wonder then that the ‘beautiful, elderly, small’ woman whom I had heard before had a different introduction to her speech. But what was worse was Roma’s determination to trivialize what Arun said by claiming that he ‘was being shamelessly mis-used by Our Man From Sri Lanka for its own ends’. I would have supposed a Fellow of Oxford Brookes University would have realized how subjective that assertion was, ignoring as it did everything that Arun himself said, and simply treating him as a tool of ‘government propaganda’. But I suppose this type of simplification is necessary if you are determined to make a point, and not take into account what has actually been said. So I suppose I should not be surprised at the way in which she denigrated what she sweepingly described as ‘the Singhala side of the audience, present undoubtedly to defend their assets in their homeland.’ They were supposed to have given ‘murderous looks’ in response to her opening her sketchbook and beginning to draw. Why they should have responded thus to some amateurish sketches is not explained. I don’t suppose they could have noticed that she was trying to equate me with Hitler. 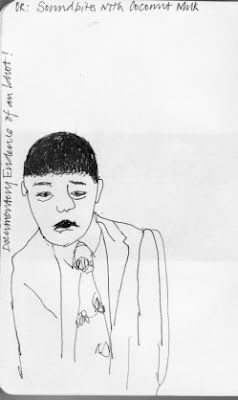 I must admit I myself did not quite understand the fuzz she had placed on my upper lip in the sketch she had drawn, until a friend said that it was an attempt to equate me with Hitler. But what might be missed in this confusion is the wholly irrelevant claim that the Sinhalese in the audience were ‘undoubtedly’ there to defend their assets in their homeland. She clearly cannot conceive that those who do not share her views might not be selfish. 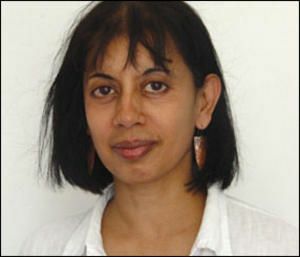 She, Roma Tearne, erudite and witty novelist, has the only point of view that is remotely acceptable, and those with other perspectives must be perverse, tools of people like me, greedy, or just callous – as she suggests the young Sinhalese and Tamils who share positive perspectives must be. What is wrong with the lady? I thought initially that perhaps she was very young, and emotionally charged, but then the article revealed that she is as old as I am, having been four years old in 1958 when she had seen a Tamil man burned to death. I could sympathize with her anguish and her bitterness at that, which is why I feel we must not be resentful at those who suffered, or who have been told about suffering, through violence in 1958 or in 1981 or 1983. But similarly we hope that they too realize that nothing of the sort has happened since, and that the murderous terrorism of the Tigers, encompassing also the murder of moderate Tamil politicians, was revenge enough, if that is what people like Roma want. To go on demanding further suffering is destructive, and that is why she should listen to people like Arun and the youngsters she scorns, who want to move forward, to create a climate in which people of all communities can more forward to prosperity with equity. But Roma is a strange lady, as I remembered when I thought back to the last time our paths had crossed. I had been invited to a South Asia Literature Festival in London, and was then told that she had decided to boycott the event because I was going to be there. 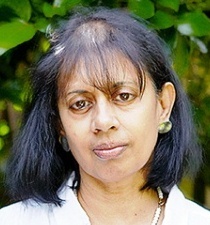 Given that my novels were the harshest critique of government involvement in the violence against Tamils of 1983, I was surprised, but I have been assured that it was nothing to do with me, it was simply that Roma was resolute in her long held stand of having nothing to do with the political forces of Sri Lanka. And in the end the discussions became fuelled with her emotional response to the situation in Sri Lanka rather than the literary dimensions of the event, and any possibility of her participation evaporated. I suppose one can only feel sorry for such people, their determination not to engage with people with other points of view, and to try to understand how we might move forward together. But I should note that there may also be other reasons for Roma’s intransigence, as well as the strange form her humour takes. I was told by a younger lady that ‘Roma Tearne has a bald patch at the front which she tries to cover up with rearranging her hair style. Probably has a hang up about hair – lack of in her case’. Whether that is the reason or not, I do hope that, at the ripe old age of 58, she gets over reliance on schoolgirl humour, and actually looks at issues with the analytical commitment one expects of a Fellow of Oxford Brookes.